This lightweight, compact and collapsible Equinox Truss Booth system is perfect for professional DJs and comes supplied with a sturdy shelf, cross bars and white front board for your own branding. - System includes: 4 sided folding Truss Booth with white front board for your own branding, shelf support cross bars and 1 carpet covered shelf. Considering purchasing the Equinox Truss Booth System? Have questions? Ask people who've recently bought one. I've looked at the dimensions of this booth and noticed that the shelf width is 1.15m maximum. I use a pair of Technics 1210s and Traktor Z2 set up and measured the total length on my set up and it comes out at 1.2m. I know this sounds like a stupid question but would I be right in assuming that my rig won't fit on this booth? Many thanks. Do you know where / what I should buy to attach my custom printed foamex logo card to the front? I've searched the internet everywhere for something that resembles the magnets attached to the supplied (blank) card bu can't find anything suitable? Any one else using custom cards found a solution? Thanks in advance. Hi, I had the same issue. I bought these, however If I bought them again, I would look for a slightly bigger size. The N42 Neidymium Magnets are super strong. What are the dimensions of the branding board please? There isn't at the moment, I guess you could do something using clamps and braces but we don't sell a complete solution yet. Is The so called 'vanity board' included? This may sound a strange question but bear with me. Regarding the magnets, are both the parts on the frame and the boards magnetic? Or are the frame ones magnets and the boards are just metal plates? The Booth has steel plates attached to it and the Facia boards have magnets. Looks an awesome piece of kit and cleat aimed at mobile DJ's like myself. With regards to lighting is there an option of a lighting bar for overhead lights? Also what about all the extension leads that typically sit beneath the booth where lighting and decks,mics etc plug into, the client will be able to see straight through the truss and see a mass of cables. Is there not an option to have a board like the centre one to cover the complete front to hide all of this? 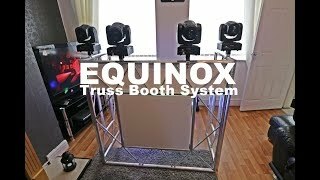 Do you own the Equinox Truss Booth System? Why not write a review based on your experience with it. very good for the price shame when it was unpacked the top foam panel was damaged i emailed DJKIT but as yet not had a reply regarding a replacement piece ? This booth is very sturdy when set up , quick easy set up like it a lot . It looks really smart proper decent with the star cloth. It's heavy though and doesn't fold down as small as I'd have hoped. It's loads to insure a van but doable to insure a car with a big boot but that means your stuff has to be compact and I'm not sure this would fit in an estate car easily. Great build quality, Looks really nice. I have added my own uprights and lighting bar to it so it's an all in one system. This is easy to put up and done in acouple of minutes, just workinmg out now what would be good to put on the side shelves. This booth is great. It's a decent size and folds down really well. The 35mm tubing makes it easy to mount lighting fixtures to it too. Awesome. Could not as for more. This is a great booth, looks so good at the fraction of the price of others. Would of been beneficial if a carry bag was supplied, but I have to purchase separately a 'replacement' bag. Fantastic!!! Once i got my head round the price and set it up i have to say it was well worth the money. Excellent build quality, looks really good and stands rock solid. Plenty of space on the included 4 x 2 foot shelf (and it is at the ideal height for me at 88 cms). Djkit delivered next day easily within the 1 hour timeframe and I was updated from dispatch to reciept. 5 stars!!! Booth itself is rig rock solid, experienced so far (not gigged yet) is if floor uneven centre can split slightly but no great issue. Aluminium truss assembly was slighted scuffed on deliver but not visible at distances, Shelf held my Denon mcx8000 in a heavy duty flightcase with no issues. Bag that come with this lets it down. there no Velcro straps inside bag to hold frame down strop it moving in transit and zip is a light weight metal zip tends to jam slightly in corners could have done with being a more heavy duty zip speeding up pack up. Had a Ultimax Trusslite Truss Gantry fitted on rear but not loaded it up yet may sped loads easier if mounted mid frame on sides. Seen a video for Equinox Truss Booth System online or have you own video? 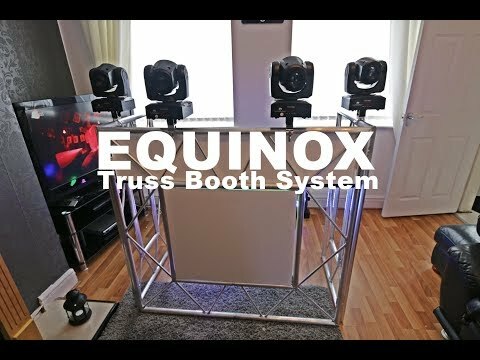 Check out Equinox Truss Booth System on DJkit.com!